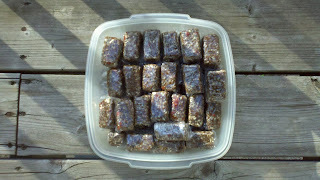 Healthy Active Lifestyle: I made raw protein bars for Hempfest in Almonte. oops, Herbfest! 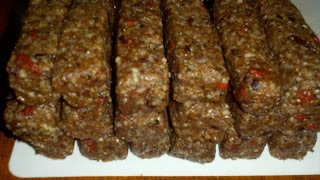 I made raw protein bars for Hempfest in Almonte. oops, Herbfest! These taste very healthy, meaning that if you can eat sugar, consider adding more dates, some maple syrup, agave nectar, molasses or honey! A granulated sweetner would also work well. 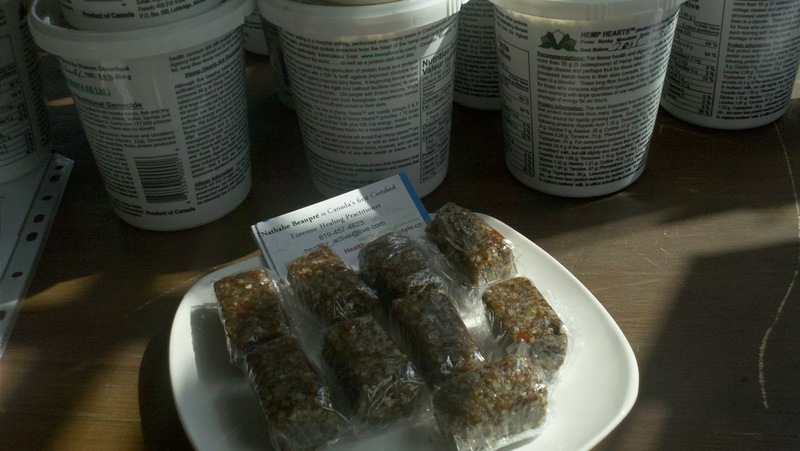 Keep in mind that I was preparing these for an event (Herbfest) so you may want to cut quantities in half. 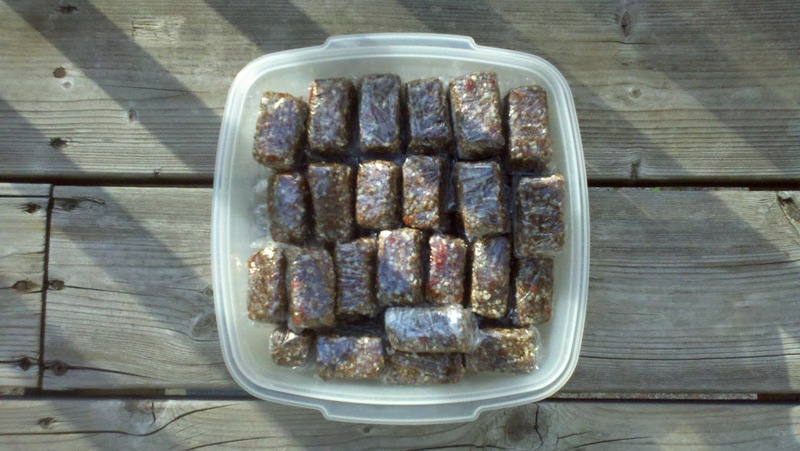 As listed, this recipe yields 24 large or 48 small bars. There are a few steps to this whole foods recipe but it is not at all complicated. First, you'll want to put the pitted dates in about one cup of water. Obviously, filtered / chlorine free! for at least a couple of hours before using them. 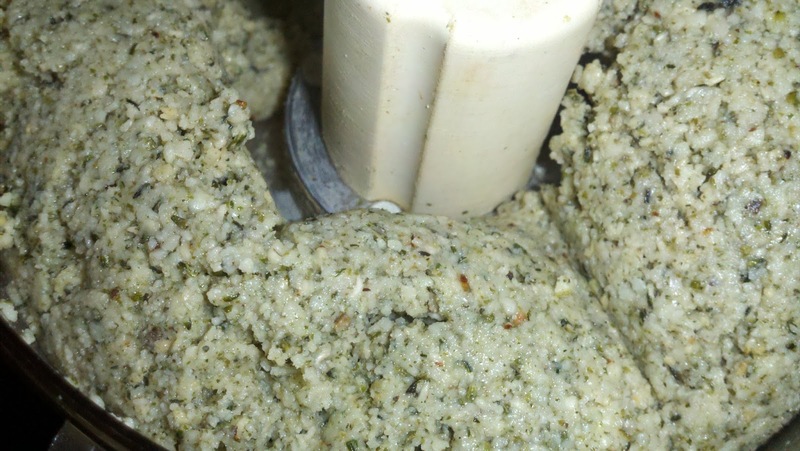 Process together or separately 2 cups of walnuts and 2 cups of hemp with the coconut oil. 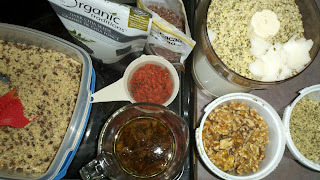 In a large mixing bowl, mix the whole hemp seeds (2 cups), ground almonds, 3/4 cocoa nibs, cinnamon and sea salt. Add the blended walnuts, hemp and oil. Mix throroughly. 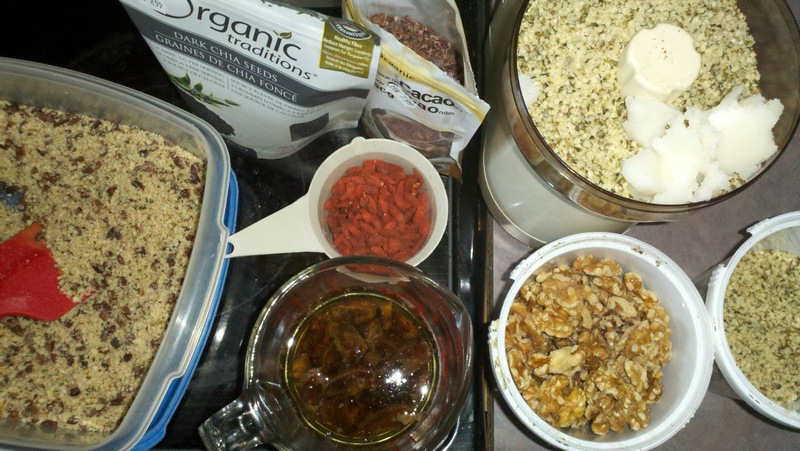 In a jar or measuring cup, place the chia seeds and goji berries. Once the dates have softened, add some of the date water and stir. Allow the seeds to absorb the liquid but you won't want them to be drenched. Chia seeds are fabulous because they will absorb excess moisture, if any, in the recipe. While the seeds and berries soak, you can make the chocolate syrup. I attempted this with my food processor, it was a bad idea. My baby bullet blender works better with liquids than the food processor. So, blend together the dates and remaining soaking water (adding more water if you feel this is required as you go along), 1/3 cup cocoa nibs and 1/3 cup carob powder. 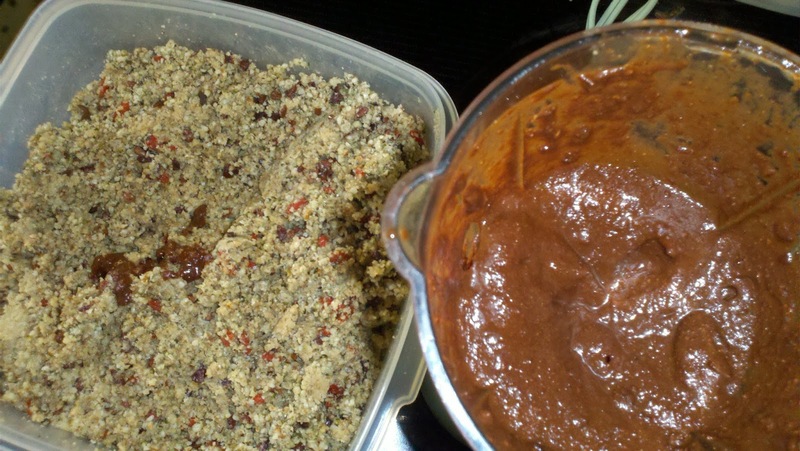 Mix the chocolate syrup into the nutty mixture in the bowl, add the swollen chia and goji berries. Mix again. Line the bars up to compare shape and sizes as you go along to keep them uniform and for smaller bars, once they are aligned and stacked, cut the pile in half so the small bars are also of the same size. Dehydrate for 2 hours at 105F and for 6 to 8 hours (overnight perhaps) at 95F. This is recommended if you will wrap them individually and want the bars to keep their shape. The bars are good without the dehydration, they'll just be softer. Healthful, high quality ingredients make healthful, high quality recipes! I will make these again soon but they will be a bit sweeter. I'll add honey. Instead of goji berries I'll be using dried blueberries as I have some on hand and because walnuts tend to be somewhat bitter when concentrated, I will try substituting with pecans and more almonds. I usually work with walnuts first when inventing a recipe because they easily become buttery. 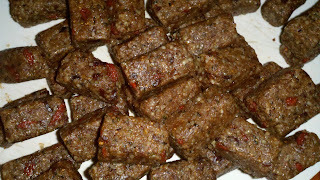 You could also add shredded coconut, sprouted buckweet, other seeds and dried fruit such as cranberries. Prunes could also be an alternative to dates, that would be interesting for sure. Use the comment section below the recipe to let me know what your combos are! hemp - processed to be like butter, literally, it turned into a ball. Almost forgot to take a picture of the chocolate syrup! I had started to pour into the dry mixture. I decided to cut the bars in half so more people can try them. Suddenly, there were 48 pieces! 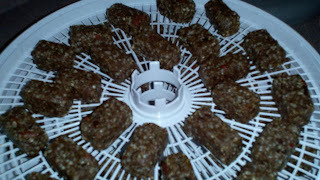 Dehydrating gave the bars a harder coating but they remained soft inside. It also prevents them from sticking to the plastic wrap and allows them to keep their shape during travel.